I just wanted to express my gratitude to the comments being left here on my blog. I am overwhelmed with the amount of kindness you all are sharing and I want you to know how much I truly appreciate your feedback on this new adventure I’m taking. Thank you! I have two projects to share with you today, the 1st is a card featuring the Build a Blossom stamp set from the upcoming Occasions Mini and the 2nd is a tutorial for making the paper bows you’ve seen on 2 of my projects. I will be posting the Paper Bow Tutorial later in the afternoon. 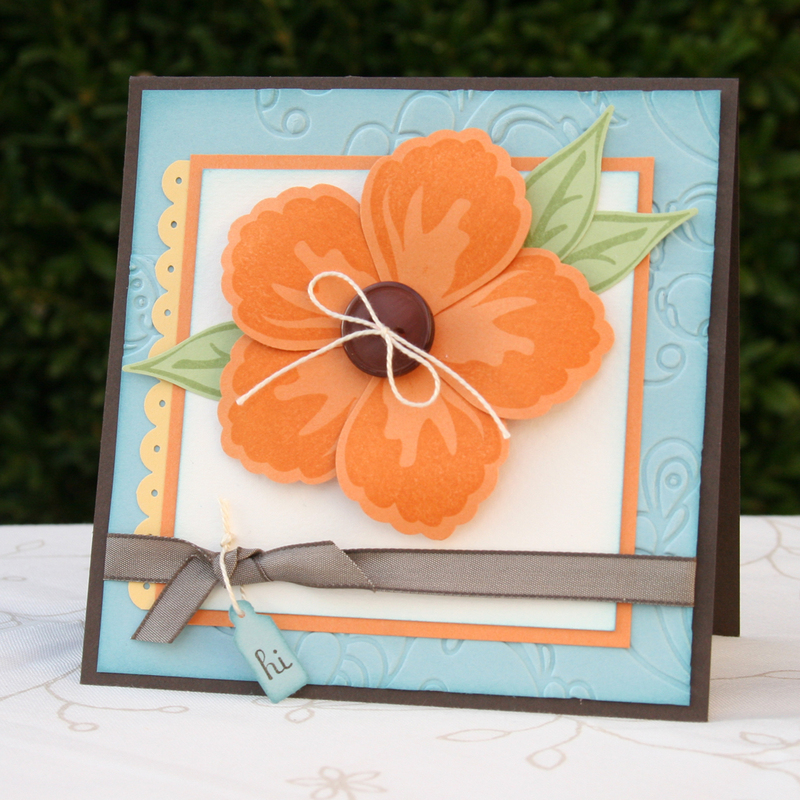 This card was such a fun project to make, I can’t get enough of the Build a Blossom stamp set and it’s coordinating punch. The large button in the center is from the Sweet Stitches Big Buttons in the Occasions Mini. I used a piece of watercolor paper for the background of the flower, whisper white was too bright and very vanilla was too yellow. The watercolor paper has a nice tone and some texture. Speaking of texture… I used the Elegant Lines Embossing Folder to create the textured Baja Breeze cardstock. Since the paper is larger than the folder, it had to be ran through the Big Shot twice to get texture on all sides. I hope you enjoyed this project and make sure to check back later today to see how to make the paper bows. I am enjoying all your card samples, great work! gorgeous card!! What are the sizes?